464 pages | 156 B/W Illus. Since the publication of the second edition, many new Bayesian tools and methods have been developed for space-time data analysis, the predictive modeling of health outcomes, and other spatial biostatistical areas. 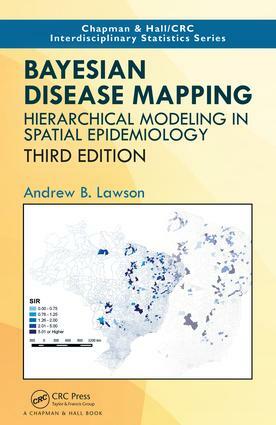 Exploring these new developments, Bayesian Disease Mapping: Hierarchical Modeling in Spatial Epidemiology, Third Edition provides an up-to-date, cohesive account of the full range of Bayesian disease mapping methods and applications. In addition to the new material, the book also covers more conventional areas such as relative risk estimation, clustering, spatial survival analysis, and longitudinal analysis. After an introduction to Bayesian inference, computation, and model assessment, the text focuses on important themes, including disease map reconstruction, cluster detection, regression and ecological analysis, putative hazard modeling, analysis of multiple scales and multiple diseases, spatial survival and longitudinal studies, spatiotemporal methods, and map surveillance. It shows how Bayesian disease mapping can yield significant insights into georeferenced health data. The target audience for this text is public health specialists, epidemiologists, and biostatisticians who need to work with geo-referenced health data. This book provides a technical grounding in spatial models while maintaining a strong grasp on applied epidemiological problems. … A welcome effort is made to clarify concepts which might, in other texts, have been skimmed over in a rush to fit models. … From the start, the concepts are illustrated with disease mapping examples, including R and WinBUGS code. … The book has relatively few errors … I recommend the book. It taught me new ideas and clarified existing ones. I shall continue to use it and I expect it to be useful for other statisticians with an interest in spatial analysis. The readers who would like to get a big picture of hierarchical modeling in spatial epidemiology in a quick fashion will find this book very useful. This book covers a range of topics in hierarchical modeling for spatial epidemiological data and provides a practical, comprehensive, and up-to-date overview of the use of spatial statistics in epidemiology. … useful for readers to track down the topics of interests and see the varieties of up-to-date modeling techniques in spatial epidemiology or, more generally, spatial binary or count data. The author also lists the reference following each method for further information. This book is an excellent reference for intermediate learners of Bayesian disease mapping … many of the methodologies discussed in this book are applicable not only to spatial epidemiology but also to many other fields that utilize spatial data. Andrew B. Lawson is a professor of biostatistics and eminent scholar in the Division of Biostatistics and Epidemiology in the College of Medicine at the Medical University of South Carolina. He is an ASA fellow and an advisor in disease mapping and risk assessment for the World Health Organization. Dr. Lawson has published over 100 journal papers and eight books and is the founding editor of Spatial and Spatio-temporal Epidemiology. He received a PhD in spatial statistics from the University of St. Andrews. His research interests include the analysis of clustered disease maps, spatial and spatio-temporal disease surveillance, nutritional measurement error, and Bayesian latent variable and SEM modeling.